Lock in a great price for Hotel Glória – rated 9.2 by recent guests! The breakfast is very good. A German traditional breakfast. The room is good, the shower is excellent. Good place for a business stay. Internet had a little problem when I arrived but it was solved very fast. Good staff. The hotel staff was great, and the room was really nice! We had a wedding on our last night, and they let us check out 2 hours late which was much needed! 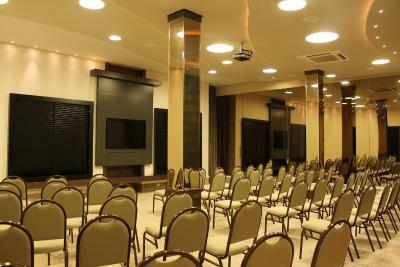 Very good location, friendly staff, very clean, well organized, parking on-site, excellent food, especially breakfast. The City was started by Germans and the hotel continues with that theme. The staff speaks German and English. Its location is walking distance to downtown with its German flair and a shopping mail two blocks away. The breakfast is unique with the staff in lederhosen etc and every cake and pie you can imagine as well as the normal fare . Saturday/Sunday it is full of locals. The rooms have been remodeled after we stayed there two years ago. The hotel is lovely and sort of old-world. The bell-hop was the most friendly bell-hop ever. The hotel is in a wonderful location in the centre of the city, so it's easy to get to all the attractions as well as restaurants and pubs. Even though it's on a very busy street, it's very quiet once you're inside. It was close to the bus station, modern, clean and the staff very polite. Moreover the breakfast was delicious! Hotel Glória This rating is a reflection of how the property compares to the industry standard when it comes to price, facilities and services available. It's based on a self-evaluation by the property. Use this rating to help choose your stay! One of our top picks in Blumenau.Just 650 feet from Blumenau’s Neumarkt shopping center and Carlos Gomes Theater, Glória offers free WiFi. Its restaurant serves a daily buffet breakfast. With a cable TV, mini-bar and private bathroom, all rooms are air-conditioned. Laundry services can be arranged. 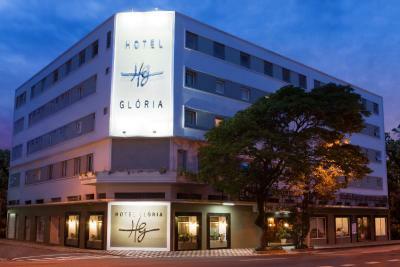 Hotel Glória is 3.3 feet from Blumenau center, and 1.9 mi from Vila Germânica district. Navegantes international airport is 34 mi away, and parking is free. This property also has one of the top-rated locations in Blumenau! Guests are happier about it compared to other properties in the area. This property is also rated for the best value in Blumenau! Guests are getting more for their money when compared to other properties in this city. When would you like to stay at Hotel Glória? This modern air-conditioned room features air conditioning, a cable flat-screen TV, mini-bar and private bathroom. This compact room has a soundproofing and air conditioning. It does not accommodate an extra bed. This quadruple room features a seating area, soundproofing and satellite TV. This small double room features a sink inside the room and a step to access the toilet and shower. The unit is fitted with mini-bar and air conditioning. House Rules Hotel Glória takes special requests – add in the next step! Hotel Glória accepts these cards and reserves the right to temporarily hold an amount prior to arrival. Please inform Hotel Glória of your expected arrival time in advance. You can use the Special Requests box when booking, or contact the property directly using the contact details in your confirmation. Small rooms. No food service by the hotel on Sundays at all. Splendid breakfast and helpful English-speaking staff! Stayed in quadruple family room - 2 separate bedrooms so very private. Recently renovated, very clean and bright and spacious. Breakfast very good selection. friendly staff. General overall, best cost-benefit in Blumenau. My bed was doing a little noise. Modern room, very clean, excellent staff and breakfast. The taxi service called by hotel. No honest about price. Nice place,warmful city and receptive people.